Keep the whole family connected no matter where they are in the house, with AirTies wireless boosters from Vox. So while you’re streaming HD videos in one room, on a video call with the family in another room and getting some work done all at the same time, AirTies will provide you with uninterrupted high-speed WiFi in every corner of your home. It’s also fully manageable via a mobile application, providing you with a wealth of statistics and information on how your home network is being utilised. Please Note: AirTies does require an existing internet connection and router for internet breakout. AirTies is sold as a self-install solution. With a simple push of a button, securely connect your devices to the internet. Install and manage your WiFi from your smartphone using the AirTies App. Extend your WiFi coverage in your home by using additional AirTies wireless access point devices. Pre-paired packs require no configuration; installation is complete as soon as the cables are plugged in. Mesh networks enable multiple access points (APs) to work in unison to deliver fast, stable WiFi. Each AP in the mesh connects to the other AP in the same network. Unlike a typical home network which is built around a centralised hub, a mesh network consists of multiple APs communicating with each other on a peer-to-peer basis. The mesh network architecture inherently allows for much more robust and survivable WiFi. When one mesh link experiences external interference (from whatever source), data traffic would temporarily be rerouted via more healthy mesh links, until the interference has dissipated. The meshed WiFi service would even survive one of the APs being shut down, as data will follow other paths to reach its destination. A mesh architecture also allows you to easily expand the range of your WiFi service by adding more mesh nodes in areas with poor coverage. This is a vast improvement over the conventional WiFi setup with one centralised gateway attempting to service the entire house. Can I hardwire my AirTies devices together? Yes. All devices can be connected together via ethernet or they can connect wirelessly. If your home is already wired with ethernet, you may want to take advantage of these connections to increase the range of your units and reduce the risk of wireless interference. The range may vary based on characteristics of your home including its building materials, layout, interference and device placement. You can extend the range of your network by adding more devices using our mesh. Note: Different materials have varying impacts on signal strength: Signal strength while next to the AP with a clear line of sight is normally between -30dB to -40dB- this is the ideal condition. Transmitting through a brick wall weakens the signal by -15dB. Transmitting through a double brick wall weakens the signal by -30dB. Transmitting through reinforced concrete weakens the signal by -53dB. You would need signal strength of at least -75dB to be able to communicate efficiently. How many devices can one access point support? One AirTies 4920 Access Point can support up to 250 devices. There is, however, a practical limitation in that all devices on a single access point share the capacity. Therefore, when each device connected to an access point has high bandwidth consumption, the access point would accommodate fewer devices before capacity is reached and performance is degraded. Is it ok if my AirTies access point feels warm? Like other electronic devices, access points are expected to get warm when they’re turned on and operating. Touching your running access point may feel comparable to touching the bottom of a laptop that’s been sitting on your lap and in use for an extended period of time. To ensure your access point is operating at an optimal temperature, please place your access point out in the open. Avoid placing access points inside of containers or in small, enclosed spaces. Don’t cover your access points with other objects. Avoid placing anything on top of it or blocking the air vents in any way. Avoid placing your access points near excessive heat or direct sunlight. Avoid placing your them in locations where they will be in direct sunlight for the majority of the day. Please also avoid placing your access points near heat sources such as fireplaces and heaters. Avoid placing them on soft surfaces. Your access points work best on a stable surface, so avoid putting them on chairs, cushions, and any other surface that doesn’t allow your access points to have space beneath them to breathe. Use the power adapter that came with your AirTies access point. Avoid using third party adapters which may not have been tested for compatibility with AirTies. Can I wire other hardware devices to my AirTies Access Point? Yes. 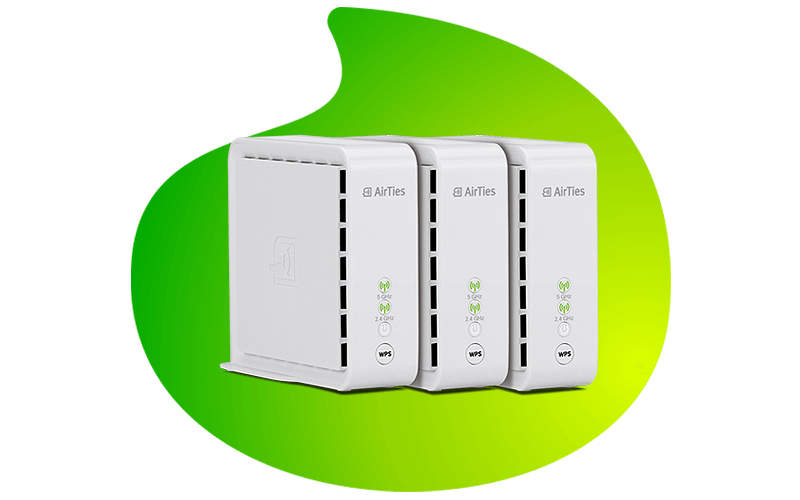 The AirTies 4920 has two 1000Mbps ethernet ports to which you can connect any device that supports an ethernet connection. This may be useful in connecting to a switch (making the number of ethernet connections theoretically unlimited), smart TVs, storage devices, gaming consoles, desktop PCs, etc. You can connect these devices to your primary AirTies access point or to any of your additional access points. How do I access the manager interface of the Air4920 device? Open a web browser (Safari, Chrome, Firefox, Internet Explorer, etc.) and browse to http://air4920.local for the first (Main) unit, http://air4920-2.local for the second unit and http://air4920-3.local for the third unit. A login page for the Air 4920 will appear. Enter “admin” in the ‘username’ field. Leave the password field blank. Click on the OK button.